In his latest Jazz North West Newsletter Fred Burnett introduced “a young lady causing quite a stir in the NW”. Fred first mentioned sixteen year old Alex Clarke in his 25th October Newsletter after she made an appearance Saturday night at Roa Island with Martin Bennett’s band, and then on Sunday with The Sun Street Stompers at the Robert Gillow in Lancaster. Mike Lovell followed up by inviting Alex to play with his SIX-IN-A-BAR band at The North Euston Hotel in Fleetwood. Fred went along and captured the above video on his phone. So as Fred says “It’s obvious why Alex is beginning to get noticed in this part of Lancashire. You can judge for yourself”! Brilliant! What a player for such a young lady..Hope to see her on TV soon. I was interested to read about Alex Clarke in your Jazz Pages. I first met Alex about 18 months ago, when playing a Sunday afternoon gig with Bryan Pendleton at The Crag Inn in Wildboar Clough. I was very impressed then with her potential, her ability to solo accurately over the chords and moreover her reading skills. Since that time, I have been able to introduce her to two big bands I play in, The Double B Jazz Orchestra in Stockport and The Harry Goulden Big Band in Warrington. In both bands, she is respected for her versatity. She is equally at home playing 2nd alto and jazz or 1st tenor/flute and jazz and also lead alto/clarinet with jazz solos. 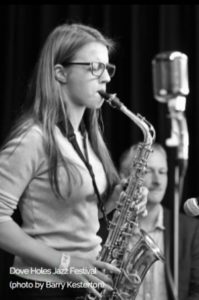 For instance, a case in point was last night when The Harry Goulden Big Band received a call at 5 o’clock from the lead alto cancelling because she was not well enough to play. Dave Mather our 1st tenor player and fixer phoned Alex and at 8pm, in walked the whole Clarke family, grandparents and all. What a great evening we had. Alex saved the day yet again! I don’t think this is the last we will hear of her!”. Thanks for this excellent comment, Fred.